Here are a few references from some of my wonderful customers! How can I thank you enough! Abby was so excited and delighted with your connection with her and Sully. She was beaming and all smiles all the way home. She couldn't quit telling her dad and mom how much fun she had and how nice you were with her. You made her day and also made me very proud of my granddaughter and horse. He really worked well for you, especially since he hasn't been used for lessons for over 5 years. I was delighted! I will get back to you this week in order to get her some more lessons lined up. She is looking forward to going on a trail ride with you. I am proud and honored to take some time to share my gratitude regarding Julia Mattson in both the person she is and the unparalleled service she provides. I started taking Horseback Riding lessons with Julia only about 4 months ago and already I feel as though I’ve been on an amazing journey to my soul’s deepest desires and happiness. In such a short time I know I have been so lucky as to find both a trusted mentor and lifelong friend in Julia (and in the horsies too ;). From day one, Julia impressed me with her knowledge and professionalism, but also her undeniably bright and glowing personality. There was no question that this lady knew her horses…but she also knows her people too! I knew right away that I was going to learn so much from this woman AND that I was going to adore her. At this point I’ve ridden and taken lessons with Julia at several different stables throughout the Portland/Metro area and on many different horses. One thing that I value SO much about working with Julia is that no matter what kind of new situation I encounter with her, whether it be riding a new horse for the first time, doing a new activity or exercise or taking a trail ride I’ve never been down before, I always feel SO SAFE with her. I trust implicitly that she would never put me into a situation that I couldn’t handle. She is uniquely perceptive to both the person and the horse and able to gauge one’s personal abilities, strengths and weaknesses and apply the perfect mixture of comfort and challenge. I know she will push me and challenge me to excel, and yet I know it will always be within the limits of safety for my current ability. Another aspect of Julia’s teaching that I value dearly is her patience and positive reinforcement. Working with horses can be a huge test of patience at times and when I’ve been frustrated, she simply reinforces the positives and models a patient and accepting attitude. In other words, I never leave a lesson feeling as though nothing was accomplished. I always know that no matter how big or small, we are making progress together. I could go on and on and if it sounds like I’m gushing, it’s because I am!! This woman is simply amazing! 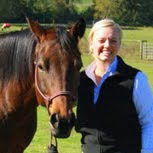 Working with Julia, it’s easy to see her passion for horses, but equally as admirable is her passion for life and in sharing that with all those she comes in contact with. It’s a beautiful thing when what we do with our lives comes into perfect harmony with who we are as individuals. It’s the mark of an exceptional teacher, professional, and human being and it’s the difference between simply teaching a skill and sharing an experience – that’s Julia, and it’s infectious, it’s impossible not be inspired by it. Beyond horsemanship, I have been learning vastly about myself and about life in ways I’d never imagined…and I know I’m changed forever. Thank you dearly Julia, for this amazing journey!